Donald Trump has been President of the United States for just over a month and in that time, the mainstream media has been busy attacking Trump and other conservatives. They are so busy blasting Trump and his people over every little thing that they fail to report the many positives that he and his administration have been accomplishing in such a short time. Actually, the mainstream media hasn’t just failed to report the positive accomplishments, they are intentionally ignoring them and don’t want the public to know about them. 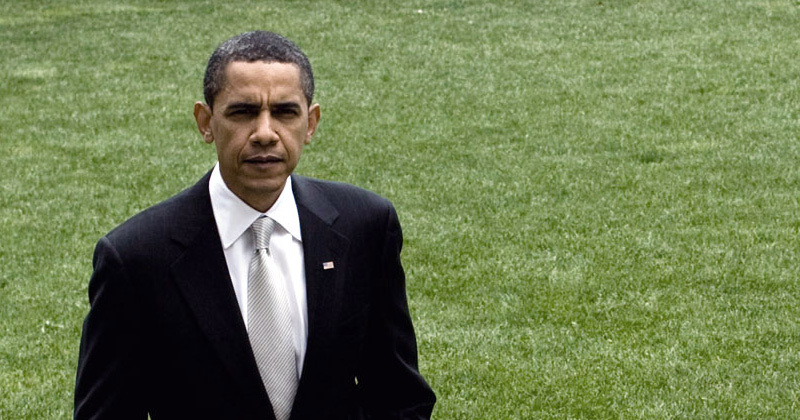 Were you aware that Barack Obama and his administration supported legalized prostitution with prostitutes as young as 10-years-old? Perhaps the lieutenants of the Clinton cartel will rat out their bosses for a lighter sentence! America is going broke. That’s not an opinion or scare tactic — it’s a fact based on simple arithmetic. President Trump could be forced to face this fact as early as March 15, the date the latest U.S. debt ceiling suspension ends. The ways to escape the debt dilemma are default, inflation, asset sales (“What do you bid for Yellowstone National Park?”), an IMF bailout, or some combination of these. Inflation spreads the losses around to all holders of fixed dollar claims including bank deposits, money market funds, annuities, insurance policies, pensions, and long-term contracts. Asset sales are a humiliation (just ask the Greeks). Besides, a lot of U.S. assets are not worth much to foreign investors if they cannot be removed, exploited, or used to generate cash-on-cash returns. An IMF bailout means that the U.S. would give up partial control of its economy to an unelected, unaccountable globalist institution with unforeseen consequences such as the displacement of the dollar by the special drawing right (SDR) as the benchmark global reserve currency. To understand why these dire outcomes are in the cards, one need only look at the U.S. debt to GDP ratio. Why is the debt-to-GDP ratio so important for understanding America’s unstable financial situation? The reason is that debt cannot be analyzed in isolation; it must be compared to the income available to support that debt. It’s no different for a country than for an individual. If you owe $25,000 on a MasterCard that may or may not be a problem. If you make $20,000 per year, the $25,000 credit card debt will eat you alive with interest payments, and penalties and possibly cause you to file for bankruptcy. On the other hand, it you make $500,000 per year, you can probably pay off the credit card with what’s in your bank account. The point is you cannot decide whether $25,000 is a high or low debt load without looking at the income that can be used to pay it off. The U.S. today has about $20 trillion in national debt. Is that high or low? If the GDP were $60 trillion, most economists would say the $20 trillion in debt was low and easily manageable. The debt-to-GDP ratio would be 33% (20/60 = 0.33). But, if the GDP were only $19 trillion, then the debt-to-GDP ratio would be 105% (20/19 = 1.05). Which is it? Sad to say, it’s the latter. The U.S. debt is about $20 trillion, and U.S. GDP is about $19 trillion giving a debt-to-GDP ratio of 105%, a very dangerous level. You can see this more clearly in the chart below. This was released in January 2017 by the Congressional Budget Office, or CBO, and shows the history of the U.S. debt-to-GDP ratio from 1790 to 2017 with projections out to 2050. This chart is also useful because it shows that prior peaks in the U.S. debt-to-GDP ratio were associated with major wars, specifically the Revolutionary War, the Civil War, World War I and World War II. After each war, the debt-to-GDP ratio declined substantially. Basically, the U.S. went into debt to fight and win major wars, and then reestablished sound national finances after the wars were over. Interestingly, the chart shows that the last time the U.S. was debt free was in 1836 during the administration of President Andrew Jackson. President Jackson was also famous for abolishing the Second Bank of the United States, which was the U.S. central bank of its time. Jackson believed in no debt and no central bank. With the exception of the Civil War and its aftermath, the U.S. had very low debt-to-GDP ratios and no central bank from 1836 to 1913. After 1913, the U.S. again had a central bank, this time called the Federal Reserve. U.S. debt-to-GDP ratios have been considerably higher ever since. Despite its usefulness, this CBO chart is distorted because it shows so-called “Federal Debt Held by the Public.” This requires some explanation. Federal debt held by the public excludes federal debt held by government agencies, such as the Social Security Administration, in trust for recipients of various entitlement programs such as retirement, disability and survivors’ benefits. But, there is no sound basis for excluding that debt. Those benefits will certainly have to be paid (neither political party is calling for entitlement reform right now), and the government securities held in trust are there to provide the means of payment. The idea that entitlements might be revised and that the debt should not be counted as “public” debt is pure fiction. That fiction also distorts the historic comparisons. The first chart shows the historic peak debt-to-GDP ratio was about 110% in 1945 at the end of World War II, and that the current ratio is about 75%. 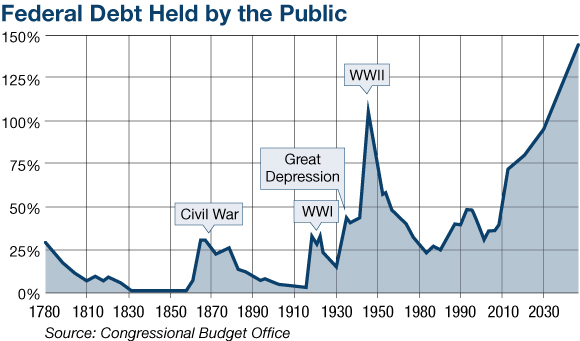 However, there was no significant amount of non-public debt in 1945 because the entitlement programs were new, off-budget, and cash-flow positive. The next chart offers a more recent historical perspective than the CBO chart, dated from 1940–2017. It also offers a more realistic picture of the actual debt-to-GDP situation. This chart includes all government debt including that held by government agencies to pay benefits. The comparison is more apples-to-apples. What this chart shows is the same World War II peak (about 121%), and that the current ratio is 105% — much higher than the 75% shown in the official CBO chart above. 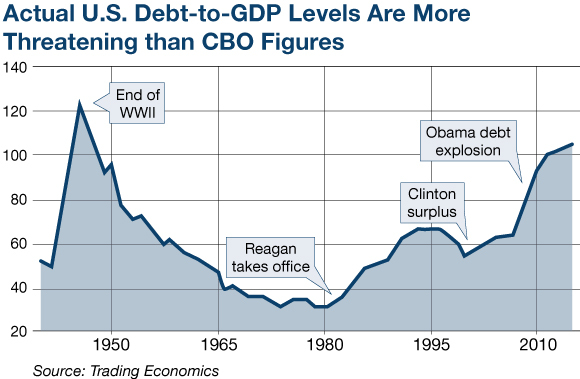 This chart also shows the steady rise of the debt-to-GDP ratio from the lows of about 33%, achieved in the 1970s during the Nixon, Ford, and Carter administrations, to the dangerous high of 105% reached in 2017. The modern era of exploding national debt really begins with Ronald Reagan and continues today with the newly installed Trump administration. That is the history we turn to now. The fiscal policy story of the period 1981 to 2017 can be summed up in a curious phrase: Feed-the-beast, starve-the-beast. 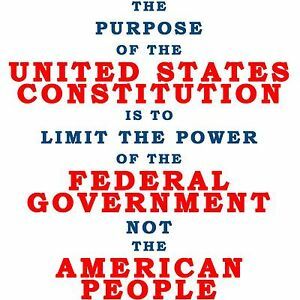 The beast, of course, is the U.S. government with its voracious appetite for taxpayer funds. Feeding the beast refers to huge deficits and expanded spending. Starving the beast refers to spending cuts and fiscal prudence. These alternating bouts of spending increases and spending cuts are amplified or mitigated by tax cuts and tax increases. These make the deficits worse, or in some cases better, than they would be based on spending alone. The problem is that the feed-the-beast, starve-the-beast strategy has been used by successive administrations to tie the hands of their successors with mixed results. It is this political dynamic, combined with the simple math of deficits and growth, which has led to the dangerous state the U.S. finds itself in today. The culmination of almost forty years of fiscal irresponsibility (with a few exceptions) has now been dumped in Donald Trump’s lap. The debt trap is not Donald Trump’s fault, but it will be his issue to resolve because it is now reaching a critical state. This debt wall may be the defining policy issue of the Trump administration although it is receiving little attention at the moment. As the debt ceiling talks approach, you’ll hear more about this in the mainstream. A bond market revolt, borderline hyperinflation or a deflationary debt implosion are all possible outcomes.